Sales industry careers have remained static for the most part in recent decades. Majority of sale professionals are hired under 1099 contractor agreements and considered full time employees with paid benefits plus commissions. Most companies do not consider hiring outside sale representatives due to the expenses incurred for compensation and travel. Inside sales allow for the company to drive more activity within a single day. The sales industry is projected to increase in employment by over 14% to the year 2020. In order to remain competitive and grow your career, expect the following related sales job interview questions to cross your path. This will help you to better prepare yourself for your next interview. Describe a time when you had to build a collaborative relationship with another department in order to achieve a sales goal. Describe the work environment or culture and its management style in which you experienced the most success. Describe three components of your philosophy with sales management that demostrate the value you add. Do you empower your salespeople to make independent decisions? Give me an example from past experience about a time when you had an underperforming employee reporting to you? How do you identify talent in others? How do you motivate your salespeople? How do you set priorities for yourself? How your your reporting staff describe your strengths and weaknesses? If I were to interview the people who have reported to you in the past, how would they describe your management style? Rate your management skills on a scale of 1 to 10 representing the excellence in management skills. Tell me about a time when you took responsibility for an error. Tell me about a time where you played an integral role in getting the sales team back on track? What constitutes failure for you? What do you least like about being in sale? What do you think are the biggest challenges our industry faces right now? What interests you most about this sales position? What is more important, a quality product or excellent customer service? What type of salespeople do you manage best? What type of salespeople frustrate you the most? What would you focus on in your first 30 days? 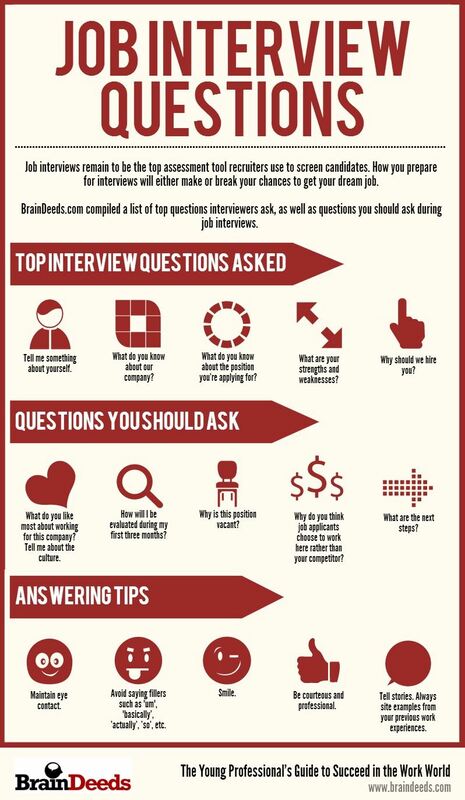 The below infographic outlines the most common general job interview questions. A listing of five easy to follow answering tips will help to guide you throughout the process to gain favor and win success at your next interview.